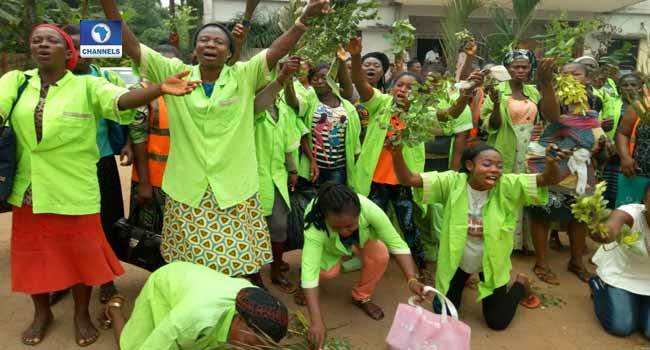 Road sweepers in Edo State on Tuesday took to the streets of Benin, the state capital to protest non-payment of their allowances. According to protesters, the state government is yet to pay them six months’ salary arrears. Aggrieved over this, the protesters stormed the Government House in Benin, wailing and chanting. They urged the state governor, Godwin Obaseki to come to their aid. One of the sweepers, who spoke to Channels Television, said despite being owed, they have been dedicated to their jobs and going about their duties. “We take transport from our house to where we sweep. I have not default one day on my job. I have been sweeping everyday even on public holiday. I have been sweeping everyday, even on Christmas and New Year,” she said. Another protester said the job exposes them to various hazards including attack by armed robbers. She claimed that she was recently attacked by armed robbers with her phone snatched but she still went back to continue the job due to her dedication. In reaction, the General Manager of the State Waste Management Board, Aiyamenkhua Akonofua said the salary backlog which was between two to three months is as a result ongoing restructuring in the agency. The sweepers had earlier in December, 2017, protested the non-payment of their allowance.